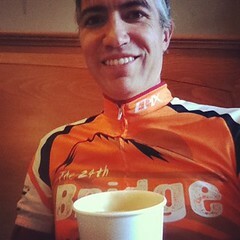 For the third year in a row, Mary G. is hosting the “Coffeeneuring Challenge.” And for the first time, I’ve taken part. And it was a ton of fun! As my readers know, I participated in Mary’s “Errandonneuring Challenge” earlier this year (the posts are here. That was fun, but this was better. 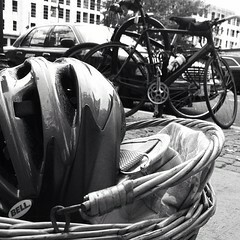 It was a good excuse to go bike riding with sprite, to explore areas both familiar and new, and to try some new-to-us coffee, tea, and chocolate shops. Notes: an impromptu ride with my usual riding buddies, leaving from Gainesville, VA, and rolling through Warrenton and Orleans, where our rest stop happened. 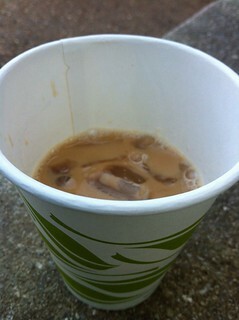 They had fresh hot coffee, but it was toasty outside, and I wanted something cold. 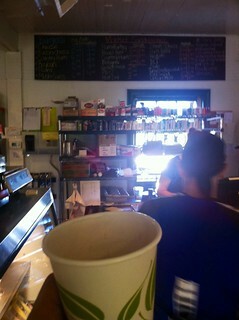 So I had the owners of the shop add some ice to my cup – all good! I love this little store, which seems to be finding its groove with the new owners. Notes: sprite and I were on vacation in New Hampshire, so we decided to take our bikes from our campground at Monadnock State Park to the nearby town of Peterborough, a lovely little mill town with a vibrant arts scene. 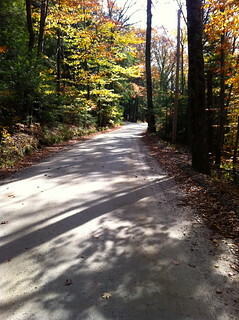 We rode on the Common Trail, one of over 60 miles of rail trails in southwestern New Hampshire. 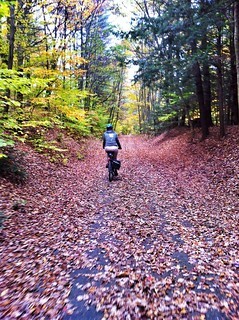 The trail was a tunnel of vibrant foliage. The cocoa was really decadent – exactly what you’d expect from a chocolatier. And as we were on vacation, we counted this as a weekday ride exception (per the rules of the challenge). Notes: rode from Gilson Pond Campground at Mt. 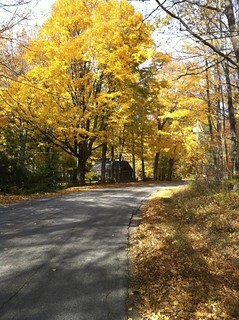 Monadnock State Park to Keene, where I met up with sprite at the end of the Cheshire Rail Trail. 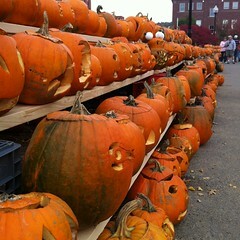 We rode into town for the Pumpkin Festival, which was a treat: over 30,000 jack-o-lanterns were on display, all with real candles inside that were to be lit before 6pm, when the Guinness Book of World Records would officially certify this year’s display as the largest-ever display of lit pumpkins. We stopped at two coffeehouses on Main Street: Prime Roast, where I bought some beans; and Brewbakers, where we both bought beverages. We both agreed that Prime Roast was probably the better place of the two. My pumpkin lattÃ© was just OK. Fortunately, we were able to drown our sorrows in hot cider, pumpkin soup, and other tasty treats from the Pumpkin Festival. Notes: after our time in New Hampshire, we visited old college friends, Erica and Eric, in the upper Hudson River Valley in New York. 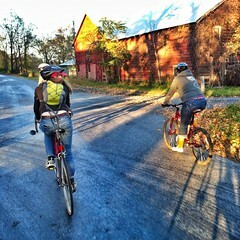 The four of us rode bikes from Red Hook to Rhinebeck to visit the New York Sheep and Wool Festival. We had a great time, with scenic riding both ways. I had two drinks from Taste Budd’s: a lattÃ©, and their sublime hot cocoa (made with their homemade chocolate ganache – mmmm). Notes: a new-to-us local joint, not far from our home, so we wove in a stop by Walgreen’s in West End to extend the distance. We rode fairly late in the day, and it was a bit chilly, yet we insisted on sitting outside. Our server was friendly and affable, and we wondered if she was a bit miffed that we wanted to be outside, while she was in short sleeves – brr! 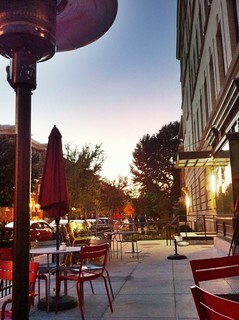 But the coffee, tea, and munchies were tasty, and the sunset down R Street was most beautiful. Notes: sprite and I had both seen this place, yet we’d not paid a visit. 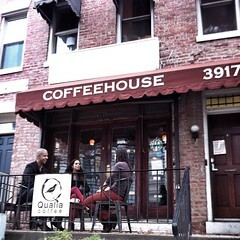 The vibe here is relaxed and friendly, and the place is certainly popular with the neighborhood. Their cardamom lattÃ© is quite wonderful. 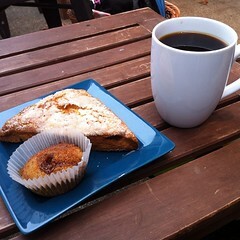 Saw two Friday Coffee Club irregulars, Paul and Brook. I’d injured my left Achilles over the weekend, so this ride was extra mellow. 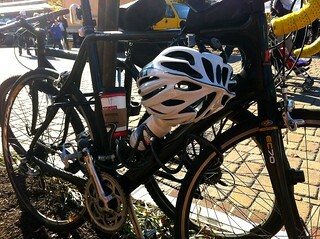 Notes: my ankle still in rest-and-recovery mode, this was an easygoing ride. We first stopped at BicycleSPACE to shop for bike bags (sprite bought a lovely little handlebar bag), and Phil shared his homemade banana bread with us (splendid). We then rode up to Big Bear CafÃ©, another new-to-us place that we’d seen many times driving back into DC from points north and east. The place is quite nice, though the service was extremely slow, the cashier seeming to forget some of our orders. We weren’t in a hurry, but still, it was noticed. 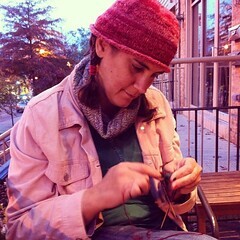 We sat outside until it became too chilly to bear. Notes: I went to Eastern Market to gather ballot petition signatures for my good friend, Charles Allen. 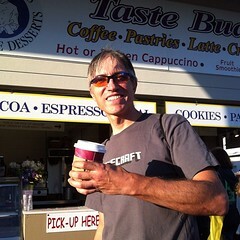 Given I was stationed outside of Port City, a coffee was a must. 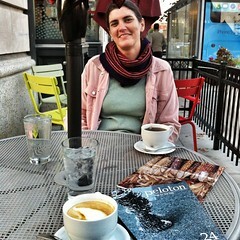 Notes: one final stab at Coffeeneuring, and another new-to-us place (though I’d had Joel’s beans before). 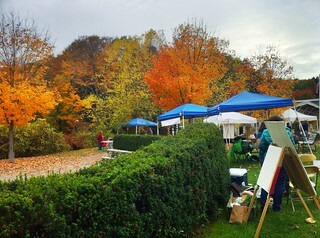 The hot drinks were great, the butternut & blue cheese quiche was awesome, and the view from the front deck was relaxing. 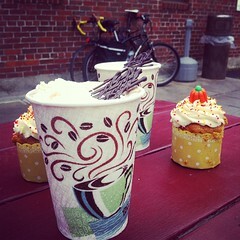 A more complete set of photos from my Coffeeneuring adventures can be seen here. All-in-all, this was a fun exercise. Thank you, Mary, for issuing the challenge!